It turns out such faith was not misplaced. Microsoft—as has been its custom the last couple years—listened and within the last six months updated the Band with all that. And more. Third-party apps: Just a couple months after the Microsoft Band came out, third-party developers were already making apps for it. This included unBand and Pimp my Band that allowed data downloading and custom screen faces, respectively. The former allows access to the .GPX data via Windows desktop. Technically, the connected app integration (e.g., Strava) is not built into the Band’s firmware, but through Microsoft Health. Both the Health app and website bring you to the following Microsoft-owned website when you click on Connected Apps: https://partners.dns-cargo.com/default. Why Microsoft picked the domain name of “dns-cargo.com” is anyone’s guess; maybe it’s because it is so neutral sounding. Functionally, there is really not much more I am wanting with the Microsoft Band now. Microsoft did a great job with this first generation device, one I can wholeheartedly recommend especially if you are a fitness or technology buff. At this time, this cross-platform wearable is in stock in many places and is not going for ridiculous markups on eBay anymore. The battery can last almost two days without recharging if you don’t use the GPS functions. I recharge the Band whenever I am taking a shower, which is usually first thing in the morning or after a run or a bike ride. This is usually enough to be able to wear the Band at all other times. Battery life when using GPS for the Running and Cycling apps seems to be only about 2.5 hours for me with the screen on. Other users are reporting 4-5 hours, but I think that must be right after a full charge and with the screen off during exercising. The heart rate monitor is reliable. It may not be EKG accurate but it is close enough. Integration with four services—MyFitnessPal, RunKeeper, MapMyFitness and now Strava—is very cool. The Microsoft Band updates each of those sites with no human intervention required. Sometimes I don’t even “know” it did until a friend makes a comment on one of my workouts. I have different friends on each of those services, and each service has its pros and cons, so I appreciate all of them being updated instead of having to pick a favorite. The most useful non-fitness function that I really appreciate is being able to glance at texts as they come in. The Starbucks app, which allows payment via barcode on the Microsoft Band at a Starbucks, consistently has been a conversational piece with the cashiers and other coffee shop patrons in line. The Band is very comfortable, even while running. Time to lock in to GPS satellites is consistently quick: usually 5-10 seconds. The Band gives you the option of starting before satellite lock-in, so no waiting is required. My Garmin devices have just been gathering dust ever since I got the Microsoft Band, and I am planning on selling them. If your Band didn’t come with a third-party screen protector (as the first units for early adopters did), and you’d rather not pay $10 for one, you can easily make one out of 2″ clear packaging tape. 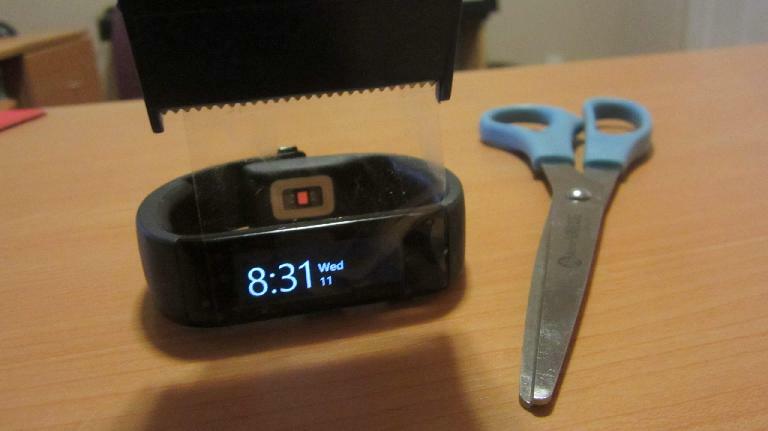 Two inches is a perfect width for a screen protector for the Microsoft Band. It isn’t as durable as the $10 one, but I can usually make a new one in 30 seconds and do not mind having to replace the screen protector every month or so. Tape made by 3M is best, although right now I am using cheaper USPS packaging tape since that is what I already have. Neither leave any residue when removed. The first generation device looks and feel very high quality, but could be more stylish. Suggestions to Microsoft include making it thinner, sleeker, and more colorful. Of course, longer battery life between charges would be appreciated. It would be great if the Microsoft Health app on the phone could record workouts for the instances you are not wearing the Band, or the Band’s battery is about to die. It would also be wonderful if the Microsoft Health app or site could import data (e.g., GPS) from other devices like the said Garmins and then automatically upload the data to MyFitnessPal, RunKeeper, MapMyFitness and Strava. Anyway, I use an iBike Newton power meter. The Issac software for it allows me to download GPS data (and other data) and combine it with the ride data from my Newton. I then export that info to Strava and MMR. I currently am trying out a few WP apps that allow me to export files to One Drive, which I have Issac set to open up too, which makes getting the .gpx files a breeze. I am hoping the band will replace my chest strap HR monitor which is ANT+, as well as use it to record the GPS tracks. Do you know the best way to get .gpx (or ,tcx even) ride files uploaded to One Drive? Does the Health app have a short cut? Also, do you ride with your phone connected to the Band, but with the phone’s GPS antenna turned off? Unfortunately I do not think Microsoft Health allows for direct export of a .gpx file. Nor does it have any native capability for uploading files to OneDrive. However, the Microsoft Band (actually Microsoft Health) connects directly to Strava, from which you can export a .gpx file. The Strava connection is really great! 1. Start the Band’s Cycling App when you begin your bike ride. 2. At some point after you finish your ride and end the app, the Band automatically synchronizes with Microsoft Health on your phone, at which point Strava gets your ride data almost instantaneously. 3. Log into Strava, find your ride and export to .gpx. When Strava prompts you for the file saving location, choose a folder within OneDrive. So saving your GPX data to OneDrive wouldn’t be automatic but not too many steps. Regarding your last question, I do ride with the Band connected to my phone which allows me to receive notifications on the Band while riding. However, note that unlike most other smart watches, the Band has its own GPS antenna and never uses the one on your phone! 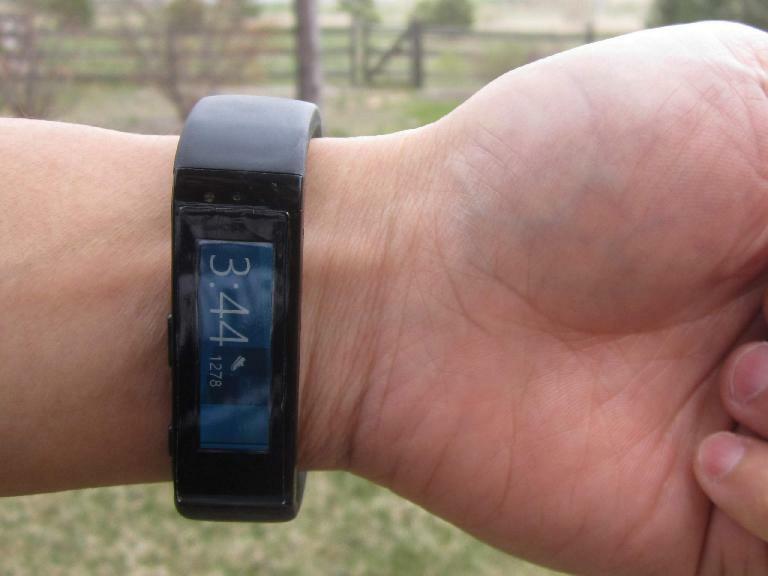 So you can track runs or rides with the Band without carrying your phone. This was one of the Microsoft Band’s primary attractions to me. I’m a Band user and despite all the negativity floating around, I think this piece of wearable is one of the best thing that you can put on your body. I have one issue though, and I am unsure if you know a solution around this. When using the running app, there is no way I can tell the time (in terms of clock) UNLESS I pause the running app and exit it, check the time, and resume back the run. However, this spoils the momentum and the pause leaves a ding mark (a pause icon) on your performance chart and GPS map (and I hate this because it leaves the impression you are taking a break). Is there anyway around this, to check the clock while on the running app? Thanks in advance. Hi Kreisler, thanks for your comment and question. Do you have watch mode activated on your Band? If so, to view the time while running with the Run app, simply press the power button. That will effectively “turn off” the display for the app—even though the app still continues to run in the background—and put you in watch mode. Press the power button again to turn on the display and show the Run app again. By the way, by “turning off” the display by pressing the power button once while in the Run app is a good way to conserve energy. Watch mode is very low power, whereas having the display on for an app seems to use considerably more.